Offering you a complete choice of products which include kudzu extract and kudzu & pueraria extract. Our organization is extremely engaged in providing a comprehensive range of Kudzu Extract to our valuable clients. These products are free from ant kind of impurities and are safely packed with fine packaging material. The products offered by us are processed in hygienic condition using progressive technology in compliance with industrial food standards. Apart from this, these are widely demanded by our prestigious clients for their effectiveness and long shelf life. The Japanese vine, Kudzu is scientifically called as Pueraria Lobata as it is a member of the genus Pueraria in the pea family. It is a perennial plant with trifoliate leaves that was brought to United States from japan in order to prevent soil erosion. The hairy leaves and stems and lobed leaves are also characteristics that help in the identification of kudzu. Roots of this plant have been employed by experts of various traditions from ancient times as an anti-inflammatory agent. 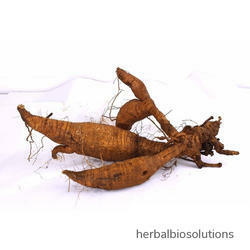 The Kudzu root Extract is a rich source of isoflavones, puerarin, daidzein, and daidzin. It is a unique herb containing natural compound called silymarin. The herb contains the flavonoids including - Puerarin,Puerarin-xyloside,Daidzin,daidzein,Daidzein-4,7-diglucoside;puerarin-7-xyloside;beta-Sitosterol;4`,6"-O- diacetylpuerarin, Arachidic acid, kudzu starch(fresh kudzu contain about 19%~20% kudzu starch,dry root contain about 10%-14% starch),allantoin;6,7 dimethoxycoumarin;daucosterol;5-methy-hydrantoin,pueroside A, pueroside B. Therapeutic PropertiesKudzu/ Pueraria Powder Extract is used as remedy for diaphoretic, antispasmodic, muscle relaxant, antipyretic, anti-inflammatory, anti-microbial, anti-leukemic agent.